Run the generator for 30 minutes after a detail to kill odors and profit an extra $80. Struggling with odors in your customers’ cars? If you’re using fragrance and odor “masking” sprays, you’re just sending the smell away temporarily. Get serious about odor: get an OzonePro™. See video: how OzonePro™ makes odor removal easy. 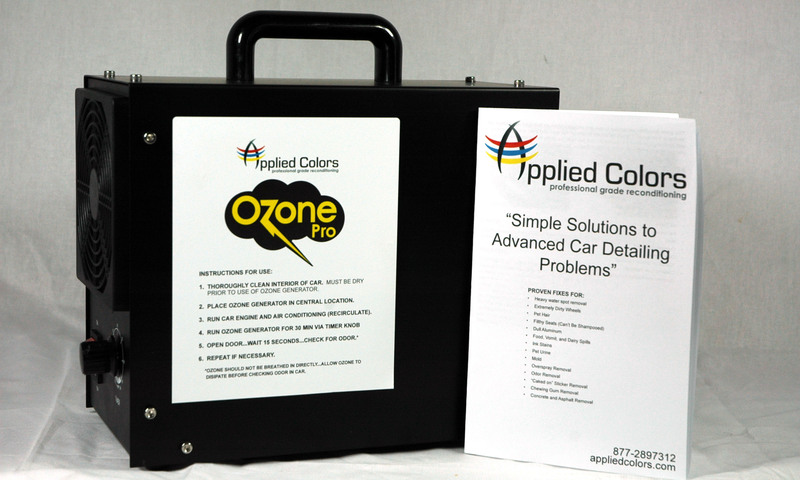 OzonePro™ is Simple to use. Completely clean and wipe all interior surfaces. Everything must be wiped down. Headliners, in particular, absorb odors. Clean with your favorite all purpose cleaner. Keep wiping until you see no residue transfer into your cleaning towels. Be certain to remove the source of the odor. If it’s rotting food beneath a drivers’ seat…be certain all the food is vacuumed/shampoo’d out. Place OzonePro in car and set timer for 30 minutes. Remove generator and “air out” car for 5 minutes. Repeat if necessary. Ozone oxidizes airborne pollutants, then reverts to oxygen, leaving behind cleansed and refreshed air. If you’re interested in the chemistry of ozone. These machines are a go-to instrument for hotel operators, disaster cleaners, car detailers and janitors alike. Ozone doesn’t mask odors, it eliminates them. Ozone odor removal is the process of placing the ozone generator inside or close to the area to be deodorized, then simply letting the machine run for a predetermined amount of time. Once ozone wash is completed, the treated area will be completely free from odor and mold. Essentially an airborne sanitizer made up of three bonded oxygen molecules, ozone is a natural, effective, and quickly-disappearing cleaning agent. Sturdy construction. Heavy duty fan and powder-coated case. Plastic handle makes moving the OzonePro™ effortless. Easy to use timer knob. Set for 30 minutes and walk away. Cheap to operate. Nothing to refill or replace, ever. The RIGHT output (1 gram per hour) for cars, trucks, and SUVs. Look out for $100 eBay units claiming 2 grams/hour…not true! And stronger units for use in hotel rooms create odors of their own. Guaranteed reliability. 5 year warranty–parts and labor. 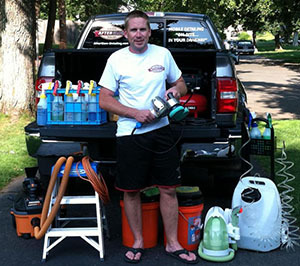 “Used the OzonePro 2 weeks ago on 2 smokers cars. I offered to come back and retreat the cars if the odor returns. I have not heard back from either customer. Click the button below to add the OzonePro Ozone Generator to your wish list.